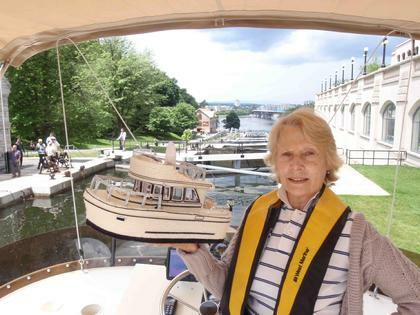 Jean Orr holds a needlepoint Camano, made by ECCO's Bernie Smith, from the bridge of Spirit of Whitby on the Ottawa Locks. We have certainly had a wonderful time - up the Hudson, across the Erie, across Lake Ontario and up the Rideau Canal to Ottawa! The Hudson has indeed a rugged charm, more is the pity we didn't spend more time ashore - we will try on the return trip and of course we plan to be back in 2011! The Erie was a delight - up though the steepest climb of locks, in the world, and through miles of dense woodland! The scale and number of locks was staggering and we stopped at some sweet towns and villages. The wx was reminiscent of our time in the Dismal Swamp and the boat got in quite a mess with the slimy green ropes, which dangled from the walls of the chasms! We were weather bound in Oswego for a couple of days waiting for the wind to die before tackling the 50 miles across Lake Ontario. With an early start through Lock 8, we got across with hardly a ripple! The Rideau Canal was a particular delight - for the most it is a series of lakes joined by flights of 2-3 locks. Much of the western part seemed to be primeval forest - punctuated by eh occasional rocky crag! We now rather regret taking only 1 week to cover the first 50 miles - we should have taken much longer! The 2nd half of the Rideau was somewhat pastoral - eventually very suburban! Occasionally we stayed in villages, which were always charming, but on most nights we favoured the moorings, by the lock gates! The setting were always authentic 19th century - the landscapes were immaculate and the tranquility broken only by the roar of water over the nearby weir! The Cruising Camanos arrived in Ottawa on the 29th June. Ottawa should not be reviewed in the context of Paris, London or Rome - nor can it be compared with a modern capital city like Washington DC, or Sydney/Canberra. Ottawa has grace and style, but it is barely a big town. Ottawa needs to be viewed in the context of the vast untamed wilderness that starts only miles from the city limits. What struck us most was the rugged athleticism of the people - similar to Norway. There are bikers, runners, campers and boaters everywhere! They also seem to have that added vigoour from a long gruelling winter - which seems to make them frenetic! Tiring to watch! The weather from arrival in Canada, until after we left Ottawa was distinctly Scottish - it rained every day (at some time) - only the intensity varied! We were determined to be in the centre of things on Canada Day and indeed we were there right in front of the Parliament and in sight of HRH! It was not without a sterling effort - we had to bike in about 5 miles from the Rockcliff Yacht Club - heavily overloaded with folding chairs - an excessive picnic (thank you MaMa) and an adequate supply of still and sparking white wine - de rigeur, I would say (but totally illegal for uptight Ottowois!). We couldn't help be impressed by spirit of the Canadians - 90% were dressed in the national colours. What was clear was that Canadian patriotism is not solely for offspring of the original European immigrant - it is totally universal - Chinese, Philipino, Indian and even Mid-East immigrants were also proudly wearing their red/white. We've seen saris and kimonos in red/white - I didn't actually see a red/white burka - maybe I just missed it! Today (July 6, 2010) we have undertaken the first leg of the return journey and are currently in Montebello, Quebec! ECCO member Jan Boys has written a book, REFLECTIONS ON THE WATER: Traveling the Waterways with God, about cruising with husband Gene aboard their Camano 31, We Be Blest III. The book can be ordered directly from Jan at kingboys3@earthlink.net. There's a $2 per book discount for ECCO members. An Easy Way for Annapolis Cruisers to Get to D.C.
On a recent cruise up the <?xml:namespace prefix = st1 ns = "urn:schemas-microsoft-com:office:smarttags" />Chesapeake we learned of and used bus service from Annapolis to D.C. It is operated by the Dillon Bus Service (dillonbus.com). It is a commuter bus running during the work week only. It picks up and drops off at the corner of West St and Calvert St., not far from the mooring field above the Spa Creek bridge. We used the dinghy dock at the foot of Conduit and walked up Cathedral - not far at all . The last bus leaves at 0720 so you must get up early. In D.C. it drops off and picks up along Independence and 14 th St. Very convenient to all the Smithsonian Museums and the National Gallery. Breakfast can be had in the Reagan Bldg. on 14th. One way fare is about $4 adults and $3 seniors. Exact change is necessary. Buses are nice with reclining seats and a head. They will be on time! A schedule from their website is necessary in order to get on the correct bus. Please send us details about a favorite cruise, or a favorite cruise destination. Email it to us at info@eastcoastcamanoowners.com. We'll post the cruise info on this page for all to share.